The final design was developed in-house at Fresh Gallery Otara by Nicole Lim and Ema Tavola. It responds to the video interviews with the Park and Library users made in August 2009. 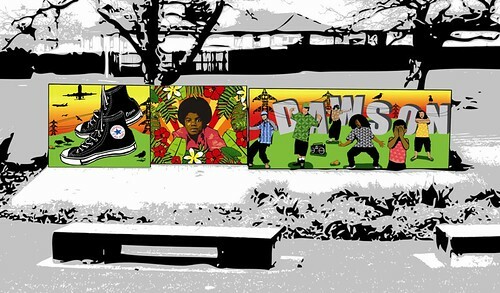 Youth culture, bold vibrant colours, Pacific and Maori patterns, strong local features and an homage to Michael Jackson were dominant themes. Nicole Lim is a qualified graphic designer who completed a Bachelor of Visual Arts through Manukau School of Visual Arts in Otara. Since July 2008, Nicole has worked as the Gallery Assistant at Fresh Gallery Otara, a Manukau City Council arts facility in the Otara Town Centre. Ema Tavola is a practising visual artist and curator. Having also completed a Bachelor of Visual Arts through Manukau School of Visual Arts in Otara, Ema has worked with community arts projects in and around Otara since 2004. She works as the Pacific Arts Coordinator for Manukau City Council and manages Fresh Gallery Otara.